First of March always feels like the first day of Spring, even though everything still looks fast asleep where I am. 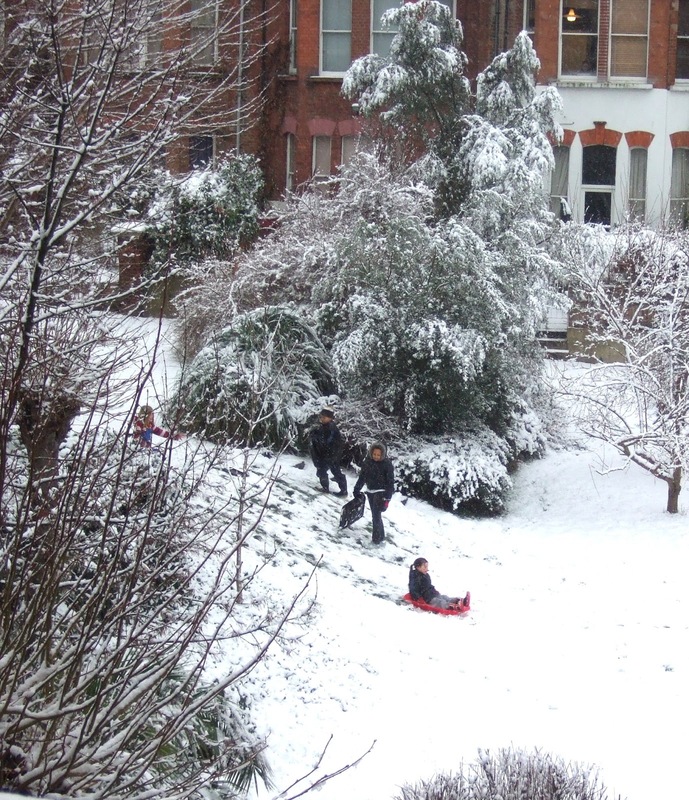 So let's get in quickly, before winter turns into Spring, and see some photos from London's wintertime. 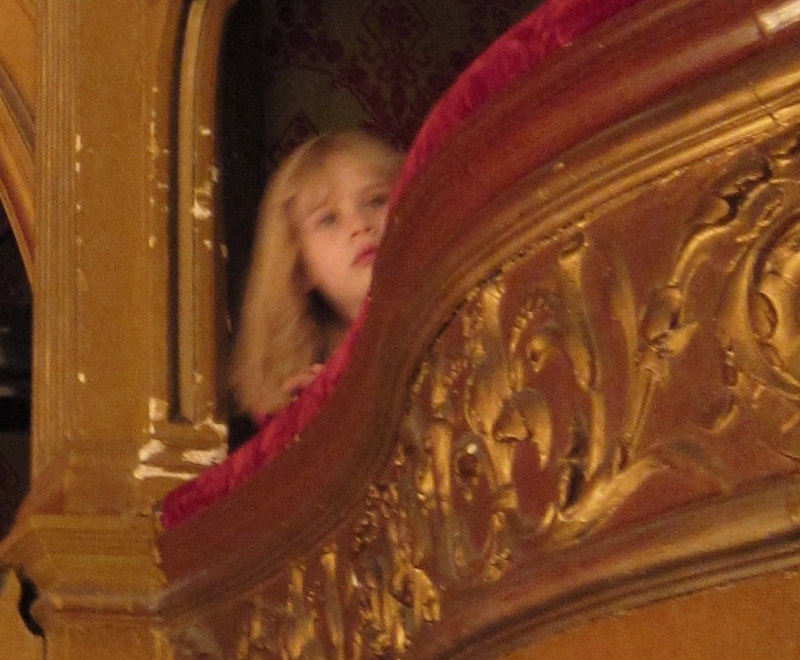 At the pantomime....a little girl is briefly glimpsed peering over the plush balustrades at the century-old Hackney Empire theatre. 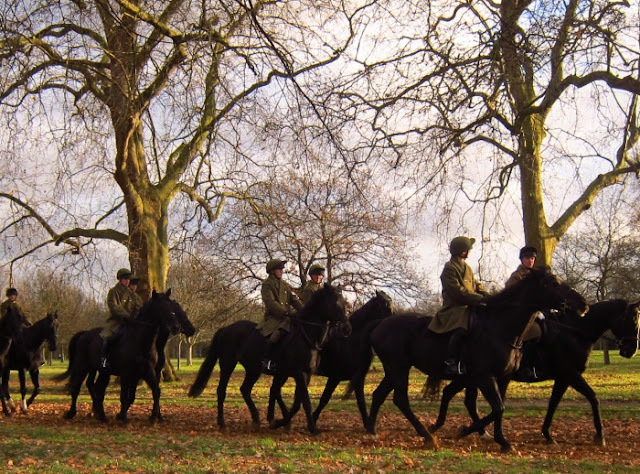 In the park...Royal guardsmen and their horses exercising, in mufti, in Hyde Park. At the palace. 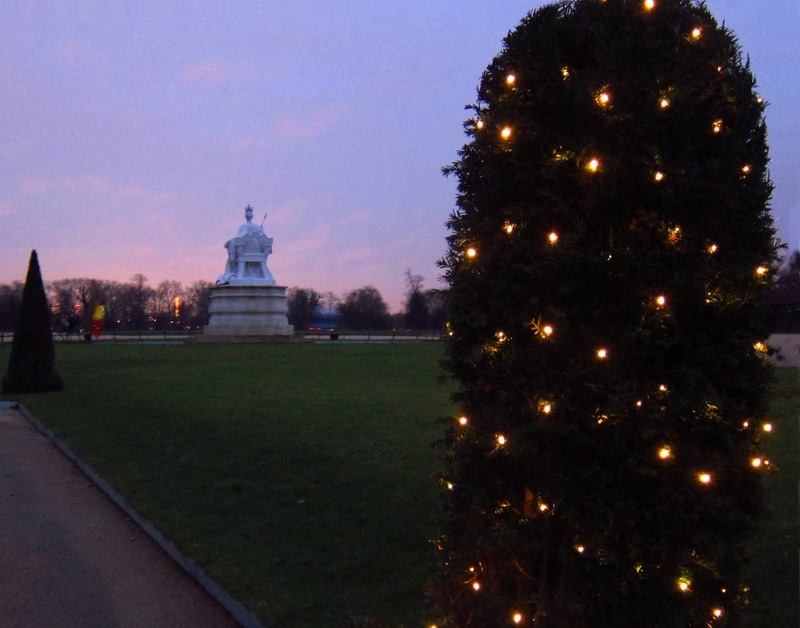 A piece of topiary illuminated for Christmas, while distant royalty, with crown and sceptre, sits on its plinth outside Kensington Palace. Two boys taking their dog for a walk in Bermondsey - or are they? 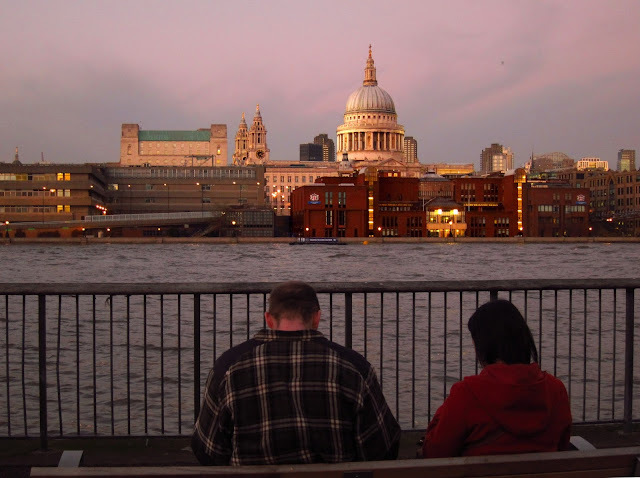 Sunset at St. Paul's Cathedral, across the river Thames - as the daylight fades, the lights of evening start to shine as bright as day. The children on sleds take first place with me. What lovely images. I remember visiting St. Paul's, and what a rush of memories that brought back. Thank you! Thank you for sharing these beautiful glimpses of Winter, many of them made me smile! I love the randomness of the pictures even though they all were taken in the winter. The fairy window display was beautiful! These are all wonderful images. They seem to be saying that spring is very eager to arrive but winter is reluctant to leave. I loved this little trip through winter, and the 'human element' in the first two. It's still quite wintery here, though I know the weather is far more mild back in the UK. That last one brought a rush to my heart - had a flat along southbank for a while and took many lovely strolls around. Thank you for the nostalgic look back. Hello Ms. Woolf. It was so nice of you to come by my place and I am happy to come and visit yours. How lovely to see that you were just in Florida and that you appreciate the wilder side of it. There are still some amazingly beautiful and primeval spots to visit and be enchanted by. I am looking forward to seeing where you take me. Peacock chick is very interesting. Spring is especially welcome this year. Your communal square garden is so beautiful! That Winter Fairy reminds me of Narnia. The two boys illusion is very clever; without your prompt I would have taken it at face value. Kensington Palace looks so different in the snow! I was there in July a few years back and it was so much more lovely! Can you tell I'm so tired of winter!!! All your photos were so much fun, it reminded me of our last trip there! Oops I forgot- one real live person and painted dog and boy! Very cool! Gee I love your exciting winter London photos. Never visited in winter. It's wonderful that you had a chance to get away for some Florida sunshine! Great pics. I always get goose bumps when I see St. Paul's and think of how close it came to being destroyed during the BLITZ. Super pics! The canal boat one is excellent, very 'Whistler' like. Super. 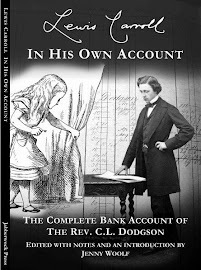 Wonderfully evocative pictures. I love the reflected houses! Great winter time photos of your London Town . . . I love the winter fairy. So beautiful. And I wouldn't mind buying a black cab for a fiver! What a feast for the eyes seeing this on this sunny Florida morning. Far away hills, as the saying goes, are always greener. 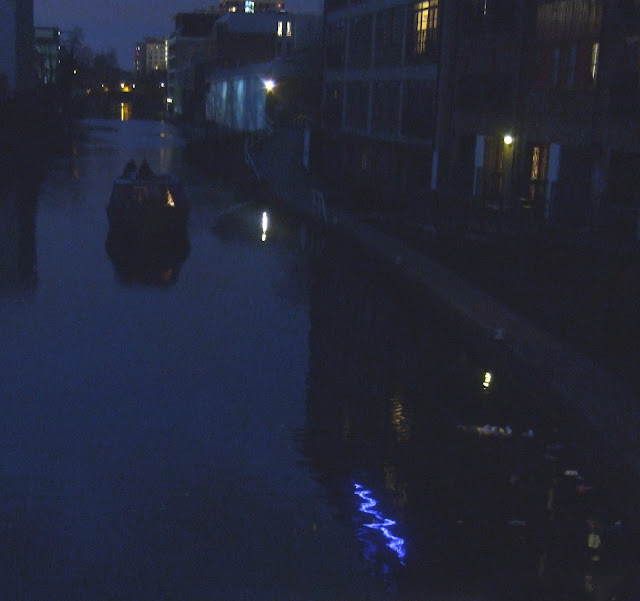 I was particularly moved by the image of the boat and the tiny triangular light. A lovely winter walk. The winter fairy would have fit right in with our Mardi Gras celebrations, so beautifully elaborate. I am always captivated by how your photos don't just show scenes but share the life and happenings. These are lovely -- that fairy is charming but my heart goes to the little girl at the panto. Such anticipation! The one with the pigeons and the upside-down panorama and the one of St. Paul's from across the river are two very poetic pictures. We've had the first sunny day today in 4 weeks - everyone was out on the fields, and so were we, it was wonderful and I felt giddy with delight! And a wondrous journey via your photos. And with the fleeting reminders of winter, may the impending spring bring rejuvenation to our hearts and minds. Your photos captivate an ambience that I truly immerse myself in. Thank you, Jenny. I know that I've mentioned this before but you produce some of the most emotionally evocative photos of anyone in my Blogworld. I was going to say that the one of the girl at the panto was unbeatable and then I scrolled down. You really have excelled yourself today Jenny. I still thing she gets the top spot though. Oh what lovely, lovely photos, Jenny. They make me long for London. Thank you! What a great set of photos! The one with the reflection is just fabulous! And I like the one with the dog and the one with St Paul's. This is a good idea, to capture winter before it goes. Would you mind if I did a similar post this week? I'll credit you for stealing your idea!!! Wonderful diversity of the all the photos today. I still love your heading photo the best but then I could because I was not driving in all that snow ! A truly charming selection of images. Congratulations. Oh yes, the mornings are becoming brighter, the weather is still cold but there is a promise of something warmer in the air. The sun is slowly trying to force the clouds apart and I'm sure at some point we will see it's smile. March is a new day with new hope for the coming year. You've got some lovely photos too. Those of images are interesting!The eighth photo puts a smile on my face! It is still cold here but spring is knocking on my garden every day! Take care not to have a cold, Jenny. Lovely pics Jenny - the canal and your back garden my favourites - oh and also the boys taking their dog for a walk! Thanks for the wintry tour of London seen from my warm home. I hope Spring comes soon for you. If you make it out to San Jose or Mountain View which is only a short distance away, let me know. My respect for a well seasoned traveler and writer. I like your reflection photo. Thank you for visiting. Another thing my Dad used to do, after he returned from London, during our holidays when we were in out teens made us write one essay a day if we were at home. We are glad he did. 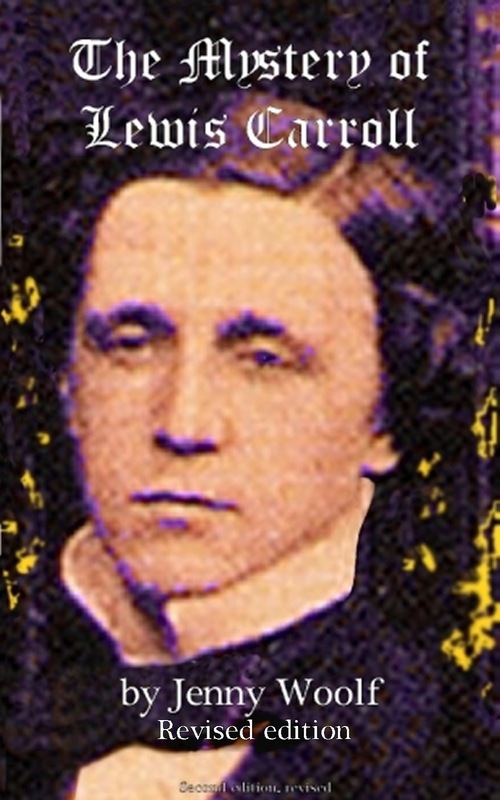 He molded an interest in reading and writing. 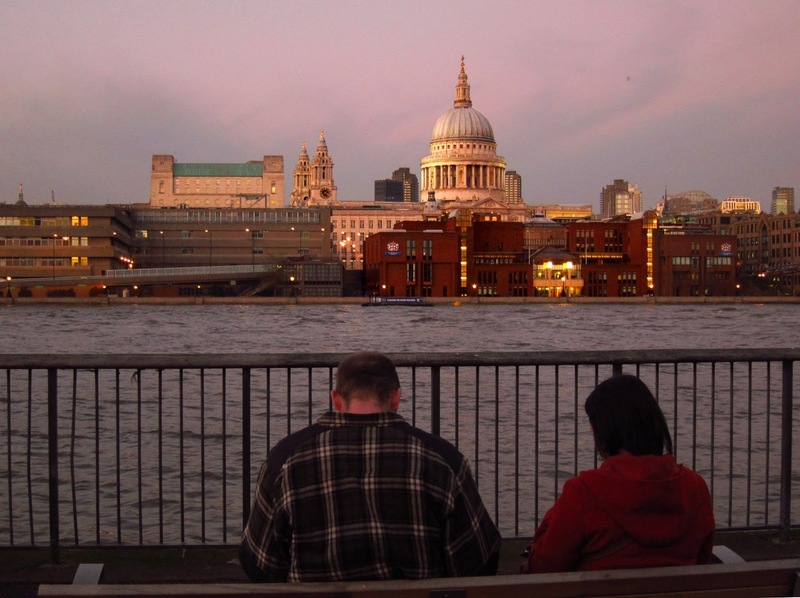 A lovely evocative set of photos - I would love to visit London again. Was there in 2004 - too long ago. Thanks for thses lovely reminders of home, Jenny. Wonderful photos, each with their own mood. Every one makes me wish to be there, be there at the exact moment the picture was taken. Don’t do this to me, Jenny. It’s not fair. I still haven’t been back, there’s always something getting in the way. I adore London, my favourite home town. And your pictures are wonderful. Thank you so much for this just in time post! It is yummy! Spring came overnight here- Flowers are abundant everywhere and the birds are having parties all day long. Lived through that dismal winter, I did...Thanks again, I love everything about this post! A great set of photographs. That first one in particular has a wonderful timeless quality about it - if digital cameras had have been available in the Edwardian period, that is the kind of photograph that would have been taken. Hi Jenny and thank you for dropping by my blog. I love these photos of London in the winter! I’ve never traveled to England but I hope to visit one day. I found the "traditional narrow boat" very interesting. That little girl peering over the balustrades is cute. The winter fairy is stunning! Love the upside down panorama of Primrose Hill. All the photos are wonderful! I like the view of your back gardens and the topiary shot with Christmas lights. thanks for your recent visit to my blog. You asked whether I have a say in the condo management....the answer is no more than any other owner (which isn't a lot). What super photos, Jenny. 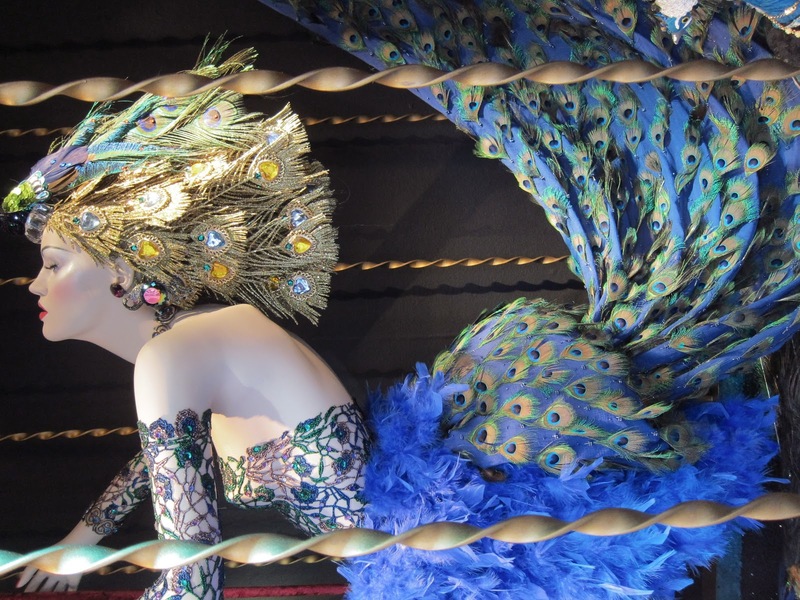 I love the Fortnum and Mason's fairy - so classy. Hello Jenny. thank you for these lovely scenes of winter in London. he little boat on the darkened canal with the little triangle of light shining out makes me want to give that a try someday. I've heard about the London canals but never got a chance to experience them when we were there in 2009. Perhaps the day will come yet . . . I can't believe I haven't replied to these comments yet, I have done so in my mind, of course! It's always interesting to me to see which pictures people like best (or don't like). I agree with Alan that I can imagine the top photo as Edwardian, or even before. I am thinking of Degas pastels. I saw the little girl scrambling about and peeping over, and it was so dark in the theatre, but I waited patiently till I saw her face and pressed the button, hoping it was not too blurred. Helen, I do try to think of winter as cosy, it's easier in the lead up to Christmas but there's also a pleasure in knowing that you have licence to sit inside and be peaceful and do nothing. But I think I am hoping to be able to say, like Linda Sue, that Spring is finally on the way now. It looks so cold but so beautiful! Have you experienced any warmer weather since you wrote this post? When I got back from sunny South Africa, it was really hard to adjust to Tokyo's winter, but fortunately the temperature is now lifting above 10 in the daytime. It probably won't last, says the pessimist. It's an old tradition that we always freeze to semi-death during hanami (cherry blossom viewing parties). Loved the photo of the graffitti. Really well done and well taken, too. Many thanks. I love your pictures. That said, I can't believe it is still so cold in London! Wonderful selection of photos around London. I especially love the dark canal one. It reminded me of Whistler's Nocturne paintings. And the puddle-jumping pigeons (you got some clear reflections there!). 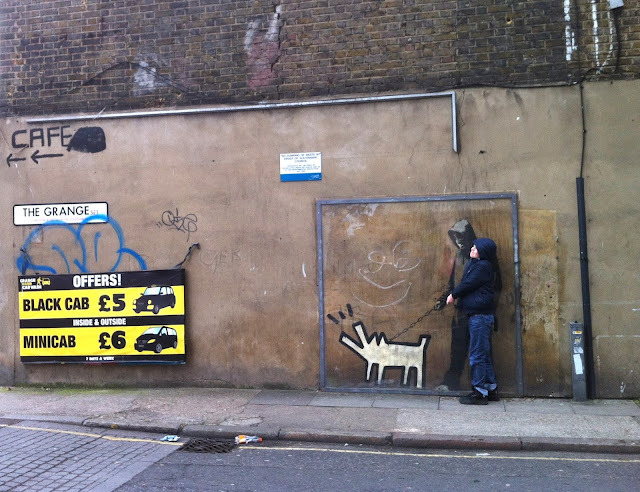 And I did a double take on the dog-graffiti one. Very funny! But all of them were quite a treat.